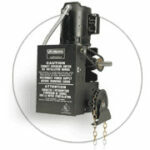 Powerful 1/2 HP, 115V single phase motor with instant reverse and internal automatic reset thermal overload. Removable without affecting limit switch settings. Continuous-duty, high starting torque motor with instant reverse and overload protection. Available in 1/3, 1/2, 3/4 and 1 H.P. ; single or three phase. Capacitor start on single phase. Removable without affecting limit switch settings. Continuous duty, high starting torque motor with overload protection. Available in 1/2, 3/4, 1 and 1-1/2 H.P. ; single phase capacitor start and three phase motors. Also available in 2 and 3 H.P. three phase.